HTPLA v3 filament in white. 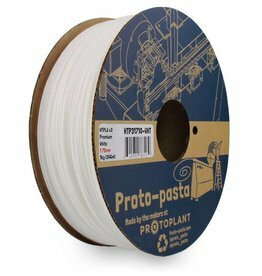 HTPLA like PLA can print at 200 °C or less, though exceptional mechanical results were achieved printing up to 250 °C or more for nearly twice the layer strength compared to 230 °C as tested in ProtoPasta lab. Heated bed is not required, but larger, more solid parts can benefit from bed temperature up to 70 °C. 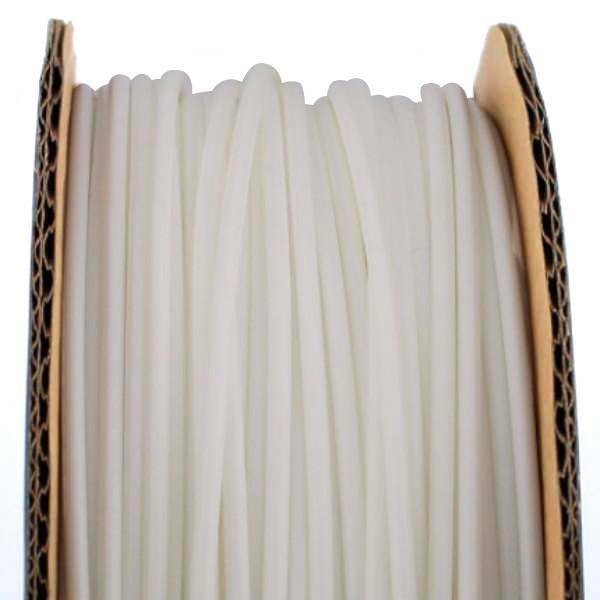 Standard build surface preparation like blue tape or glue stick work best along with slow (10-20 mm/s) and hot (220C+) first layer with enough gap not to restrict material extrusion. Bake your parts into a oven until you see a change from translucent to opaque. There is an obvious visual change indicating the improved performance! In as little as 5-10 minutes for small, thin parts and as much a few hours for massive parts, HTPLA v3 parts crystallize in an oven at 110C +/- 10 °C to become more stiff. We recommend leaving the supports on your parts, placing them on a non-radiating surface (like glass, ceramic, or composite), and letting them cool in the oven to minimize distortion. Parts can be baked at a lower temperature (though must be above 60 °C for any change to occur) for a longer time with less risk of unwanted deformation. Best results are with flat and/or supported parts with 100% infill. In this instance we experienced x/y shrinkage of only 0.5% and negligible z change.